Would you like to enhance your credibility and authenticity factor on the platform? You can do it by applying a technique that actors have been using successfully for decades. © copyright 2013 by Successful Speaker, Inc. All rights reserved. Attorneys have great deal in common with actors. They face negative stereotypes that they must continuously seek to destroy: actors are unreliable, phony airheads; attorneys are longwinded, arrogant sheisters. © copyright 2009 by Successful Speaker, Inc. All rights reserved. Research has shown that the impression that business speakers make on their listeners is influenced mainly by their visual and vocal impact. While many business speakers today focus on preparing content, they would be wise to increase the time spent on their visual and vocal style: how they deliver their message to persuade the listener. To this end, business people can borrow techniques that actors use. 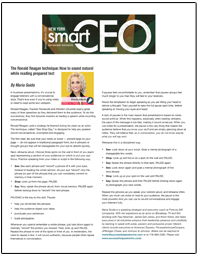 © copyright 2008 by Successful Speaker, Inc. All rights reserved. © copyright 2007 by Successful Speaker, Inc. All rights reserved. When addressing a business audience, situate yourself in the position of power (usually front and center). Begin with both feet planted firmly on the floor and imagine that your feet are tree roots that extend deep into the ground. Stand away from furniture and other temptations to lean for support (when at a podium, stand tall). Keep hands/arms open and available for natural gestures. Take stage at every moment: at the end of your presentation, pause to receive and experience your applause with a smile. How do actors get the audience’s attention and keep them riveted to the action of a play? One answer is that actors “take stage”: they inhabit the space with a “do or die” purpose and an attitude of complete belonging. 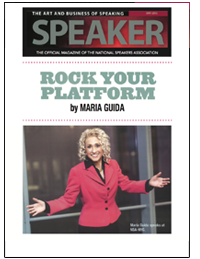 Business speakers, too, need to take stage during every speaking event. They must command the space and project passion about their message in order to persuade and inspire the business audience. The speaker’s position on stage, body language/gestures, and comments must all further this objective. © copyright 2006 by Successful Speaker, Inc. All rights reserved. The idea of working abroad can be exciting but also a bit overwhelming. Depending on the country, language and cultural differences could prove to be a challenge. 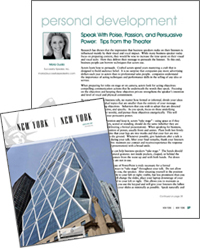 “Linguistic issues are half the problem,” says Maria Guida, a NYWICI member who has delivered communication skills training programs to Fortune 100 companies in the New York area through her company, Successful Speaker, Inc.